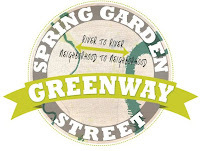 Many cyclists use Spring Garden Street to travel across town from Northern Liberties and the River Wards over to West Center City and West Philly. Imagine what it could look like if the street was better designed to calm traffic, increase safety for cyclists and pedestrians and be a greener corridor? segment that will transform the 2.2 mile crosstown arterial road across the top of Center City. This new on-road trail will serve as the East Coast Greenway route through Philadelphia connecting the trail from the Delaware River over to the Schuylkill. On Thursday, October 27th, there will be a public input meeting to allow you to share your ideas and concerns about the project.